1987 Carvin DC-150 :: stripped down & bursted — Chubbuck Guitars :: making & repairing Guitars in a old building just north of Boston, Mass. 1987 Carvin DC-150 with a clear finish. This will be a quick photo essay on a recent strip and refinish project. The guitar is a quilted maple 1987 Carvin DC-150 that was custom ordered with a Kahler Spyder tremolo, an active stereo preamp and Holdsworth H22 humbucker pickups (note the double pole pieces). The customer wanted to give the guitar a little more character with a new transparent sunburst and covert the guitar's active stereo electronics to passive mono. Along the way we decided to add a belly carve to the back. Solid two-piece quilted maple body. Beautiful figured all-maple construction finished in a surprisingly thin polyurethane clear finish. A look inside the control cavity at the active circuit. The controls: neck volume, neck tone, bridge volume, bridge tone, coil taps for each pickup and a phase switch when running both pickups. Note the stereo output jacks to split the signal from each pickup. This will all be removed and converted to passive and mono. Sanding of the sides was done by hand. Here I rigged up some quick dust collection for sanding the cutaways. I used a cabinet scraper on the neck and body corners with surprising ease in removing a bulk of the finish. The owner wanted a belly carve on the back to make the guitar sit more comfortably. I worked with him closely on how much to carve and even had him stop by and draw out exactly what he wanted. Buried in the maple shavings are my new Lie-Nielsen spokeshaves (amazing tools). 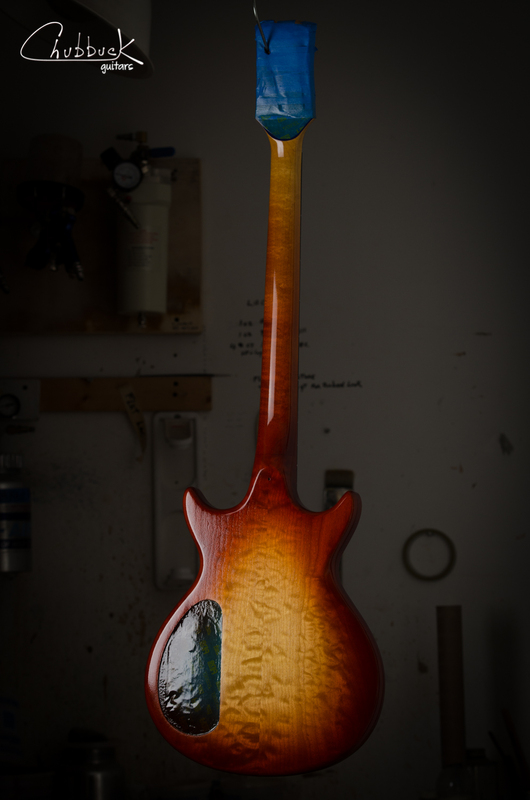 The customer wanted to add a little character with a transparent cherry sunburst. Color layers are applied and ready to begin sealing in with clear lacquer. Here is the back view in the booth. You can see the texture or "orange peel" that will be scuff sanded after the first round of clear coats have dried in prep for more top coats. The headstock's face, rear and sides were left with the original finish and the new nitro finish is blended into these transition points. Here it is buffed and set up. The black pickup rings were swapped for cream rings. This quilted maple in combination with the new finish gives a fire-like appearance.